Moscow has announced its intention to establish a military air base on the territory of its neighbour. It could well be a response to U.S. plans to deploy a missile defence shield in Europe. 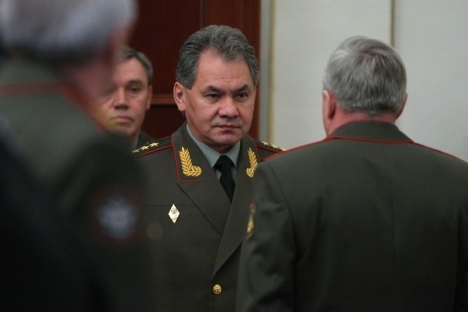 Russian Defence Minister Army General Sergei Shoigu's recent visit to Belarus for talks with his counterpart Lieutenant General Yuri Zhadobin and a meeting with President Alexander Lukashenko unearthed a sensation. Russia intends to site an air base in its friend and ally Belarus. Its establishment had already been agreed by Presidents Vladimir Putin and Alexander Lukashenko, but the decision was only announced during Shoigu's trip to Minsk. According to the Russian Minister of Defence, the first facility to be built in Belarus will be an aircraft commandant's office (there is no official information regarding which aerodrome), which will be followed by an echelon of Russian fighter planes on combat duty (at least three aircraft) and the deployment of a full air regiment by 2015. “Thereafter,” stated Shoigu, “we expect to address the need to strengthen the defence capability of our Belarusian colleagues and brothers.” For that purpose, four divisions of S-300 anti-aircraft missile systems will be delivered to Minsk in 2014. Why is a Russian air base being set up in Belarus? There are some valid reasons. First, Moscow and Minsk are both members of the Collective Security Treaty Organization (CSTO) and strategic allies on a bilateral footing. For several years now, Belarus and Russia have operated a combined force, which includes some units of Russia's Western Military District (before its formation, units of the Moscow Military District). There is also a Joint Air Defence Command, which forms part of the CSTO air defence system. Second, Moscow's ally already hosts two Russian military bases. The ‘Volga’ early-warning radar system in the settlement of Gantsevichy near Baranovichy, and the ‘Antei’ high-frequency radio station, located at Vileika, for communication with ships anywhere in the world at sea. There is also an underground precision-time facility. Do they need to be supplemented by an air base? That is a question for the presidents and military chiefs. The answer is likely to be found in the actions of NATO, which has sited its own air base at Siauliai, Lithuania. Located there in a state of permanent combat readiness are four F-16 fighter bombers, which are capable of delivering U.S. B-61 nuclear gravity bombs, currently housed at air bases in five NATO members (Belgium, Germany, Italy, the Netherlands, Turkey), to their designated targets. For Russia, these bombs (which are tactical nuclear weapons deployed on fighter bombers) are of strategic relevance, since the flight time from Siauliai to Minsk or Smolensk or Moscow is about 15 minutes. Is it necessary to protect an ally against such a contingency? Absolutely. Do not forget that the U.S. also harbours plans to site missile defence facilities in Poland, which could neutralise Russia's strategic deterrence. Washington claims to be prepared to meet Moscow halfway and modify its plans, but the Kremlin says that the proposed changes “do not allay our concerns.” In the meantime, the air base in Belarus is likely to act as a kind of shield against any potential unpleasantness that could arise over the ABM system in Poland. How can NATO's recurrent wars on foreign soil (Yugoslavia, Iraq, Afghanistan, Libya) over the past 20 years be forgotten? Even now the alliance is helping the Syrian opposition to wage war against the country's legitimate government, with the involvement of Al-Qaeda militants. In all this time, Russia has had to spring to the defence of its peacekeepers and citizens just once — to counter the aggression of the Georgian army in South Ossetia in August 2008. And Russia was not the initiator of the conflict, which was later recognized by the European Commission. This logic of events is the root cause of the present mutual distrust. Therefore, it is my opinion that Russia will take retaliatory measures.